As the new school year has begun, many parents have undoubtedly been busy planning and managing their children’s extracurricular lessons and activities. Some may have already started preparing their children for important exams at the end of the year. But perhaps not as many would have started planning how they would best fund their children’s university education, either due to ignorance or not knowing how to begin, especially if that time is at least 10 or more years away. However, to do nothing could prove very unwise. Some hope that their children would be able to qualify for one of the local universities to escape the crippling cost of an overseas university education. The NUS Office of Admissions has a web page showing the tuition fees for academic year 2018/2019 – with $12,650 per academic year for a law degree and $8,200 per year for an arts or science degree (for Singapore citizens only). In April last year, it was reported in the Straits Times that, since 2010, university fees have gone up every year, ranging from a 0.6% to 8% increase per year. A 2016 CNBC report provides data that showed the inflation rate of a law degree in NUS was 8.2% per annum, from 2007 to 2016. Even a general arts or science degree had an inflation rate of 3.2%, which is higher than Singapore’s core inflation. Mind you, these are figures for Singapore citizens only, after deducting the MOE tuition grant. For permanent residents and foreigners, the costs are much higher due to lesser or no government subsidies. What if you were to send your children overseas for a university education? Many are currently attracted to the UK due to the attractive foreign exchange rate between the British Pound and the Singapore Dollar. For example, the University of Oxford (UK) lists the tuition fees for a law degree at £26,235 per year (for overseas students) with expected living costs of about £18,000 per year (excluding travel and other misc costs like health insurance, etc). At today’s exchange rate, that could come to a tidy sum of about £44,235 (S$78,300) per year, or about S$235,000 for the entire 3-year course. It is easy to say that we would prefer our children to attend a local university to save costs. 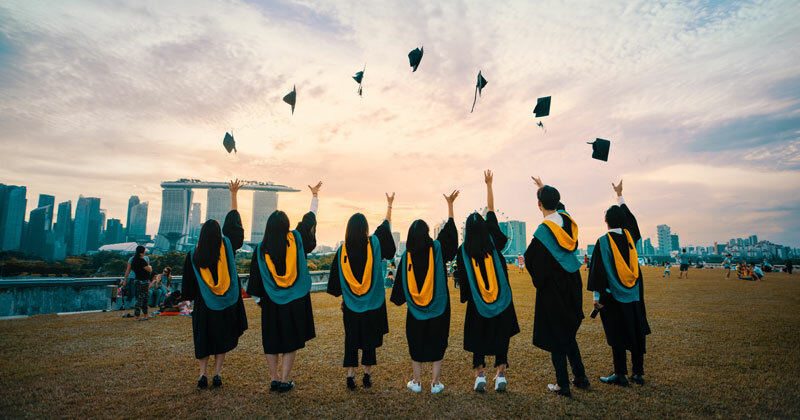 However, statistics from The Ministry of Education show that in 2017, only 35.8% of a Primary One cohort made it to a publicly-funded degree in Singapore (this includes the 6 local universities, LaSalle and NAFA). That’s about 3 out of 10 Primary 1 students. As most parents would very much like to help fulfil their child’s aspirations, it could mean having to set aside money early and perhaps making sacrifices just in case you will need to send them for an overseas university education. It thus makes sense to then start saving up for this as early as possible. Proper planning of available resources is crucial to help you get to where you want by the time your child reaches university age. Below is an indication of how much you would need to save each month to achieve $200,000 by then, with the corresponding rate of return and investment period. You will immediately notice that time horizon (years invested) makes a more significant difference in how much you need to set aside per month, compared to the rate of return. Insurance agents like to sell education endowment policies to help pay for tertiary education expenses, particularly overseas ones. One selling feature of these plans is that these policies typically come with a guaranteed return component. However, what this means is that the assets that the policy invests in are usually lower risk with a corresponding lower return, e.g. the guaranteed returns on such endowment policies are typically below 3%. This would barely keep up with inflation on education costs, which means it would take up a whole lot of your disposable income to pay for such policies. The alternative is to consider investing in assets that are expected to grow at a rate of return that outpaces inflation. By doing so, the outlay is lower and the goal can be achieved with fewer dollars as compared to an endowment policy. However, as these higher rates of return come with the corresponding risk of capital loss during down markets, it is important that this approach makes use of a robust risk management framework. In general, to mitigate risks, a long time horizon is preferable, plus proper global diversification over one’s portfolio. Diversifying in reference to a global benchmark is helpful as it ensures that the portfolio can keep up with the latest changes in the markets, e.g. should China continue its ascent as an economic superpower, or some countries disappear altogether, all of that will be captured in your portfolio. Diversification also helps to ensure that a blowup in one region won’t leave your education plan in shambles. Next, a proper asset allocation plan is also vital to reduce the amount of risky assets in the portfolio the closer the goal or the shorter the horizon becomes. It serves parents no purpose to have their 100% stocks portfolio drop by half the very year that they need to withdraw some money to pay for tuition fees. Systematic rebalancing and a gradual shift in asset allocation will help give assets a safe buffer to shelter them from adverse market conditions. If you have the available resources, you could also consider a dual-pronged plan which places a portion in an education insurance endowment policy to take advantage of the guaranteed component, and the rest into an investment plan. For the endowment plan, parents should also take up the premium waiver for the payee in case death or critical illness should befall – as this would enable the policy to be fully funded until maturity. A combination of an endowment plan and an investment portfolio could give you the best of both worlds, which would cost much less than than an endowment policy alone. The proportion you need to place in either plan would vary with the risk you want to assume. But increasing the fixed income allocation as you approach the planned withdrawal date could help mitigate this risk. DIY or Ask for Expert Advice? If you decide to do this alone, there are many online resources for you to check up on. However, working with a fiduciary adviser can help you set up the education plan, to manage risk, cashflow, and investment expectations, and to help in your transition to a less risky asset allocation as you approach the withdrawal date. Higher education comes with a high and increasing price tag, so it makes sense to plan well in advance. Many uncertainties and unknowns could crop up, and there is no “one size fits all” approach to solving these problems. However, by having a disciplined approach towards saving and investing, parents can greatly remove much of the anxiety and uncertainty from the process. Previous: Will the Year of the Pig be luckier than the Dog? Next: Valentine’s Day – Love your finances!